A new study shows that we’re all a bunch of gross makeup hoarders who don’t know when to throw things away. In a survey about the makeup routines of 4,052 consumers by new cosmetics company Stowaway, it was discovered that most of us continue to use old, expired products like HEATHENS. The survey found that 87% of consumers are aware that makeup has expiration dates. So, sure. I think it’s obvious that being aware of something is not the same as actually caring about it. It’s sort of like how you know that drinking an entire bottle of wine in one sitting isn’t exactly great, but that definitely ain’t going to stop you from doing it. Even though we hold onto our products for a long time, many women don’t end up finishing them anyway. They also found that one of the reasons many women don’t like to throw away expired products because it feels like they’re wasting money. I find that I have this problem specifically with my splurge products or anything that is generally pretty pricey. For example, I’ve had the same tube of Nars Illuminator for longer than I’d like to think about. I use this product almost every time I put on makeup and it still barely feels like I make a dent, which I sort of love considering it costs $30 a pop. Clearly this is something that I would probably do well to have less of considering that it’s probably definitely expired. Eye makeup is the most common beauty product that we hold onto, so naturally, they’re also the products that expire the fastest. Stowaway found that less than 1 in 5 consumers throw away mascara within the three month time frame that is recommended. This idea of expiration dates and safety is clearly important to Stowaway. However, I have to wonder how much of a concern this is to a large swarth consumers. Personally, I’m not much of a germaphobe. Considering that nothing has ever resulted from this practice of using old products, I don’t feel much pressure to change it. Still, even when it does cause problems, most consumers don’t change their acts anyway. The question then becomes about the economics and practicality around the way we consume beauty products. Stowaway allows you to create your own kit of products which are ideally small enough for you to carry around without taking up too much space. The average consumer owns almost 40 makeup products but only use and carries 5 of them daily. That means the average person owns 8 times more makeup than they use! When I lived in New York, I carried around makeup with me almost everyday. I often went out to dinner or drinks straight from work and wanted to be able to touch up my makeup at the office before I headed out. At the time, smaller sizes would have been a Godsend considering that my way too big tote bag was already heavier than a rock. Now, I work from home and am rarely gone from my apartment for large chunks of time, lessening my need to have products on-hand. What’s most interesting, and perhaps the biggest aim of Stowaway, is impacting the way we spend our money. Over email, I asked Stowawy co-founder and CEO, Julie Fredrickson about our perception of value when it comes to our beauty products. My favorite brand of lipstick is MAC which costs $17 a tube. 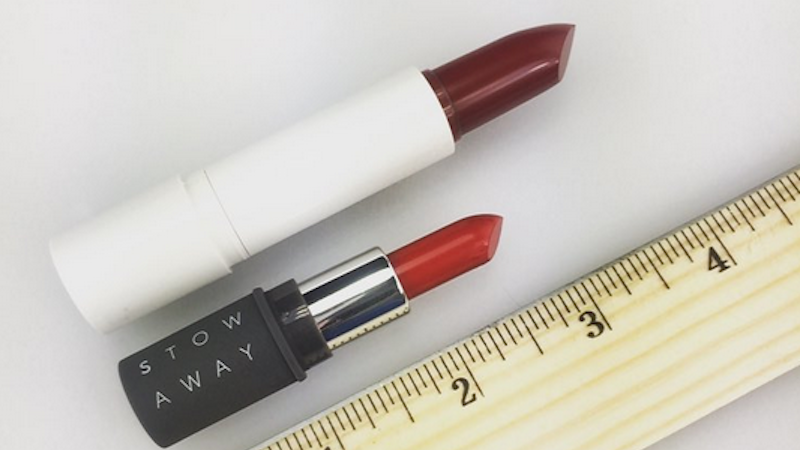 Stowaway sells a smaller creme lipstick for $15. Considering that I’m probably not going to throw away my old lipsticks anyway, I asked Julie why I wouldn’t want to spend an extra $2 for quite a bit more product. She explained that Stowaway products are made as competitors to high end, luxury products that are subject to the extreme markups like $52 lipstick from Tom Ford. “Our products and formulations are benchmarked against the real best of breed of the cosmetics industry. We are half the size and half the price of those high performers in the prestige category. This make sense. Stowaway offers products like a beauty balm for $22, mascara for $12 and eyeliner for $10. If you’re regularly dropping, say, $25 for Bobbi Brown eyeliner, then a smaller product that’s less than half the price and a decreased chance of infecting your eye is probably a smart move. Comparatively, if you’re someone who generally buys makeup from the drugstore, your $8 tube of lipstick makes you less victim to the disproportionate markups that you’d find with luxury beauty brands. “I’d say that even if a larger size can feel like a better value, if you don’t end up using it, then it isn’t actually a good use of your money. If I’m being honest, I doubt I’ll stop buying MAC lipstick and using it for longer than I should. But Julie makes a good point about the current market not being the best value for the customer. For something like mascara and assuming I stick to only using a tube for three months, it probably isn’t the best use of my money, even if I’m spending $6 to $7 on a drugstore brand. However, I do have to wonder, if you’re someone who is wiling to spend $35 on a compact of blush or $25 for one tube of lipstick, how likely are you to even want to scale down your makeup collection? Stowaway provides an economical, streamlined experience, yes, but how much fun is in that? Sometimes you just want to pick from ten different eyeshadows or way too many almost identical shades of lipstick. As with anything, you need balance and while you probably won’t run out and replace your entire makeup collection with Stowaway’s right-sized products, they can help you to at least start thinking about finding a happy medium.